The Bay of Islands is considered the birthplace of modern New Zealand, and the history of Kerikeri, Waitangi and Russell being the focus of very different Maori and European encounters. In Kerikeri Basin, the Mission House and then later the Stone Store were established by the Church Missionery Society, while the local Maori lead by the famous leader Hongi Hika observed with curiosity. Kerikeri is the site of the very first permanent European settlement, and there is an excellent (and free) historic reserve at the site at Marsden Cross. Events here and around the Bay shaped the famous Waitangi Treaty, and the future of both Maori and European settlement. Image: The historic Mission House & Stone Store, Kororipo Heritage Park. The Waitangi Treaty Grounds are one of the most significant sites in New Zealand. Located with a commanding view over the Bay and across to Russell, ‘Treaty House’ was the home of New Zealand’s official ‘gentleman in residence’ James Busby, and was built with its strategic location in mind. The impressive museum opened in 2016, and tells the story of the early interactions between Dutch, French and British that culminated in the signing of the Treat of Waitangi; New Zealand’s founding document. It has interactive exhibitions including the treaty itself, and many Taonga (sacred treasures) and is worth at least a 3+ hour visit. 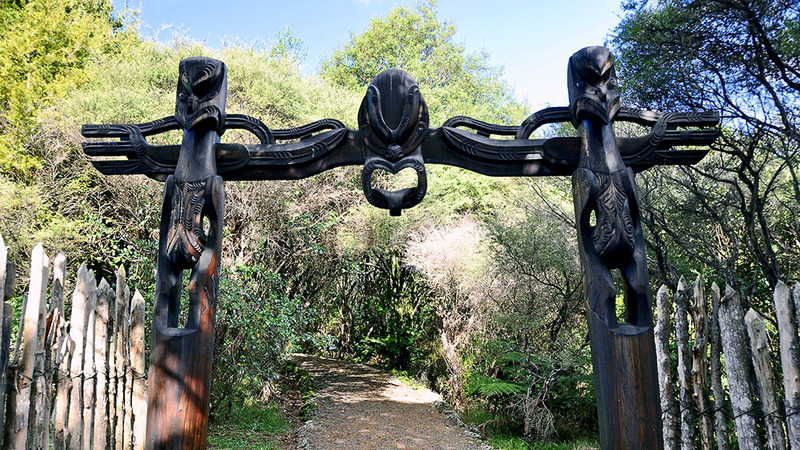 Entry includes an excellent guided tour of the grounds and cultural performance in the magnificent Whare Nui – the carved meeting house. 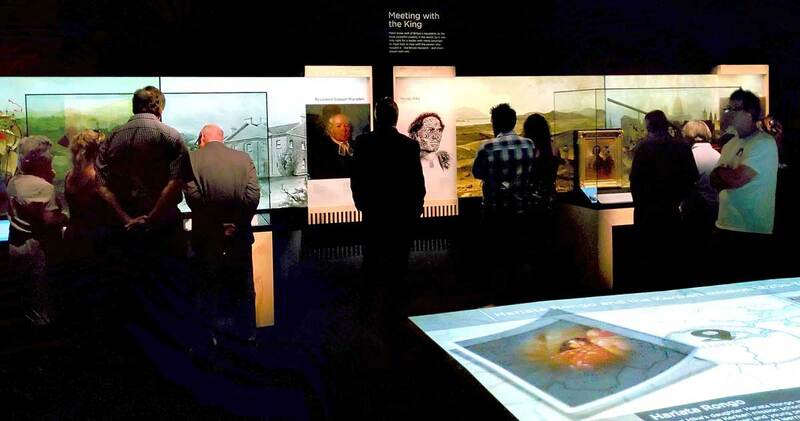 Image: interior of Waitangi Musuem – a visit is essential for visitors wanting to understand New Zealand’s birth as a nation, and its unique culture. No visit to the Bay of Islands would be complete without a stroll through the streets of ‘Romantic Russell‘. Now a charming waterfront village, in its past it was known as ‘the hell-hole of the Pacific’, full of bawdy and unruly sailors, escaped convicts, prostitutes and traders from across the region. Hongi Hika famously cut down the British flag raised on the hill here, in protest of the behaviour of the town’s people, the the way the Maori were being treated. There were many attempts to burn the town down. Image below: ‘Romantic Russell’ viewed from Flagstaff Hill, where Hongi Hika famously cut down the British flag in protest. The Far North has one of the largest Maori populations in New Zealand, with ample opportunities for guests to experience legends and stories, food and cultural performances, and maybe even take a ride on a traditional Waka. or war canoe. Image below: Rupapekapeka Pa was the site of one of the most fierce battles between the Britsh and Maori during the ‘Northern Wars’, and well worth a visit. Surrounding the Bay of Islands are many day trips to unique experiences that aren’t on the radar of many tradition touring itineraries. Host Lionel’s great, great, great grandfather’s signature appears on the Treaty of Waitangi and his family have strong links to its history. We would be pleased to share our insights to guests wishing to experience Maori hospitality.